Not quite a cliffhanger but this post is very overdue. Here’s to the in’s & out’s of Kapha dosha types. We need a little reminder at this stage. Ayurvedic sages observed that the natural world contains energy in the form of five elements: ether, air, fire, water and earth. These elements are the basis of all matter and energy, all living beings. According to Vedic knowledge the 5 elements combine to form 3 energy fields which are referred to as Vata, Pitta and Kapha. These fields are present in and around us. Our bodies are made up of all 3 energies in different proportions. We are born with our unique ratio of doshas. This is our natural constitution, a distinct combination called Prakruti. Learning about the doshas and which are more present in our physiology helps us understand our true nature and how best to care for it. Do the test to find out which dosha or doshas are prominent in you: Know your a, b, c’s. To refer to all my previous posts on doshas you can do a search on the site filtering the blog using the “category” look-up which you’ll find in your side bar from the home page if on a PC or at the bottom of the page if on a tablet or phone. 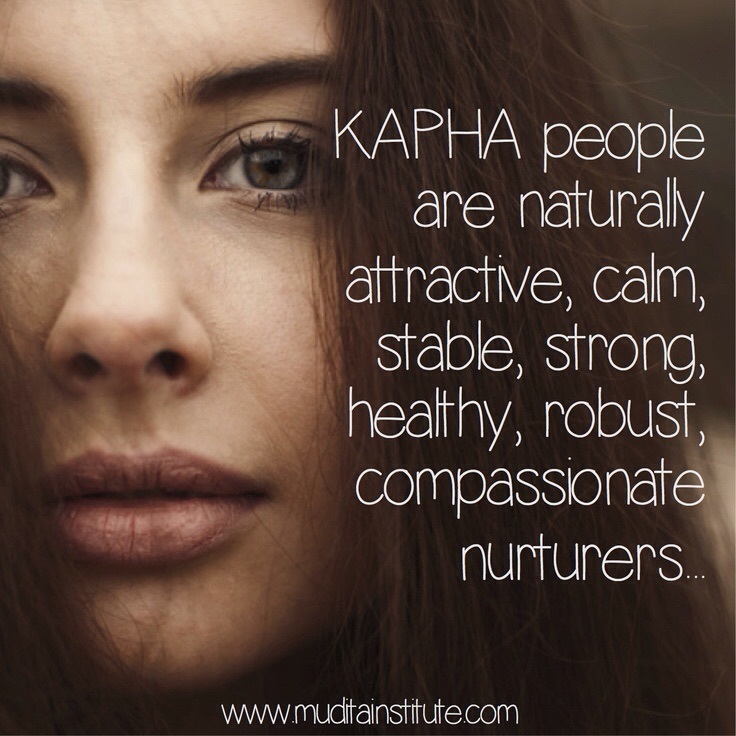 Your Kapha type tends to move in a slow, graceful and relaxed fashion. If Kapha, your body frame is usually more curvy, possibly stocky. You gain weight easily, lose it with difficulty. You have thick, oily or lustrous hair. Your skin is smooth, soft, moist and perhaps oily. You have soft, large and firm features in general and a deep & pleasant voice. You are physically strong and have stamina. You are affectionate, caring, calm, patient, happy, supportive and serene. You are sociable and make friends easily though you’re quite homely. You have strong immunity. You don’t need much food but have a constant appetite, often craving food. You’re a deep sleeper and find it hard to get out of bed. You are slow, deliberate and methodical of character, even tempered, steady, sympathetic and sensitive. Easy-going and sweet would best illustrate your personality. Kapha dosha is the one that holds everything together, the glue that binds the cells. It promotes anabolism, governs the formation of physical structure and is responsible for the strength and cohesion of cells, tissues, organs, muscles and bones. It regulates body mass and fluids. It lubricates our joints, moisturises the skin, helps to heal wounds. And it brings vigor and stability. When Kapha is in balance it expresses qualities of love, calm and compassion. However like with all doshas we must be vigilant to getting out of balance. When we have an excess of a particular dosha we tend to lean towards our imbalance with our lifestyle only making the side-effects worse. An excess of Kapha would display as becoming heavy, sluggish, dull, fatigued and drowsy – possibly obese too. In the body it would form an excess of mucous, you could suffer sinus headaches, respiratory problems such as asthma and wheezing. Lung congestion, cough, colds and mucous secretions are common disorders in children and teens which is considered a Kapha phase of life of physical growth and body structuring. The aggravated Kapha type would become insecure, greedy, jealous or intolerant and be prone to deep depression of the kind that disables normal functioning. How do you tackle aggravated Kapha dosha and restore optimum wellbeing? As like increases like, the opposite treatment helps redress the balance. Changes in diet and daily routine can bring dramatic results. I truly believe that. Beware too much of the sugary, salty and fatty stuff in your diet. Restrict your intake of those as well as fried foods, heavy foods and dairies. Be strict with yourself especially with reducing sweetness on your plate. You must kindle your inner fire through a varied diet. Spices are good for you and hot dishes are actually helpful. Dry and astringent foods are recommended if congested. Only eat when hungry and limit portion size. Do not overeat basically as this will create ama (undigested food & toxins) in the body causing health problems. Watch your weight. Sip hot water all day but in small quantities. Ginger and turmeric tea is particularly good. Stay warm. Use heating pads in winter. 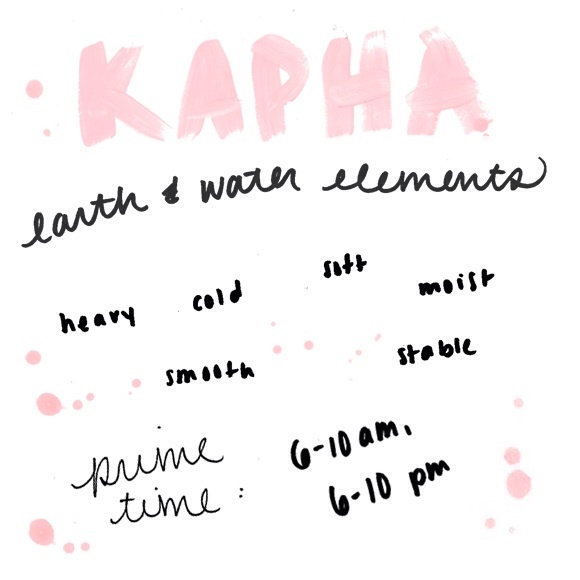 Kapha is a cold dosha and you are sensitive to damp and cold so layer up. Create stimulation in your life and a variety of experiences. This includes regular physical exercise that brings a proper sweat and push you to your limit as well as activities that invigorate your mind, energise your senses and revitalise your spirit. Go dancing, jump on a trampoline, take a run outside preferably in a sunny spot, jump out of a plane, take on a big project that challenges you and keeps your brain engaged to complete it. Shake it all up! Meditate to spark the alertness already inside of you. Perform a full body daily dry massage on yourself called garshana using raw silk gloves or a brush. Avoid oils when out of balance. This practice will stimulate your circulation if done briskly under 10 minutes at the beginning of each day. You are a happy person by nature, remember that sweet soul! If you think you might be suffering from depression seek help – and you may want to consult the book Healing Depression The Mind-Body Way, Creating Happiness With Meditation, Yoga And Ayurveda by Nancy Liebler Ph.D. and Sandra Moss M.S.P.H. The book is an absolute fountain of wisdom even if you’re only looking for support “coping with the problems of daily living” (quoting the back sleeve). Its knowledge of Ayurveda is second to none, and the principles of Ayurveda are explained with absolute clarity. A very good read for anyone interested in deepening their knowledge of Ayurveda. I felt I am the person in this post. I always knew that I have Kapha dosha. But all the responsibility of growing kids makes you forget who you are. Thanks for reminding me what I am and what should I do to stay in balance. Cause right now I am totally out balance inside out.